You are currently browsing the tag archive for the ‘The Twelfth Night’ tag. With Pride celebrations popping up as per usual throughout the summer months across the world, New York City was of course no different. On the heals of the official ‘week’ the Shakespeare in the Park continues to celebrate as it inches closer to the fall theatre season. 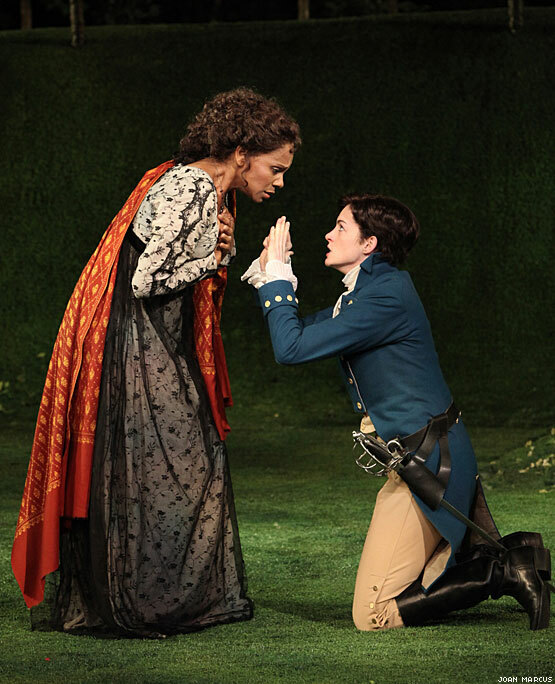 Part of this year’s programme line up includes The Twelfth Night (June 10 – July 12) staring Private Practice’s Audra McDonald and big screen starlet Anne Hathaway as Olivia and Viola, respectively. Hathaway celebrates many firsts within the casting, not only is it her debut in public theatre, it’s also the first time she’s ever kissed a woman! Unfamiliar with The Twelfth Night? Shakespeare in the Park describes it as a beguiling comedy which follows the romantic adventures of Viola and her identical twin Sebastian, both shipwrecked in the enchanted dukedom of Illyria. At the helm of this time-honored story of cross-dressing and mistaken identity, all in the name of love, is Tony Award winning Director Daniel Sullivan. For a little outdoor Shakespeare action a little closer to home for readers in Newfoundland, there is the reliable Shakespeare by the Sea troop who’ve worked hard to put together a brilliant summer season. This year’s line up includes the classic Romeo & Juliet (July 5 – Aug. 10) and The Tempest (July 17 – Aug. 15) along with a Fairy Tale Mix Up (July 11 – Aug. 16) written and directed by Newfoundland’s own Krista Hann. Also for the kids, Classics by Candlelight (July 4 – Aug. 16) returns this year and Tunes ‘n Tales (July 6 – Aug. 10) is an addition following Romeo & Juliet performances which celebrates authentic Newfoundland music and yarns.